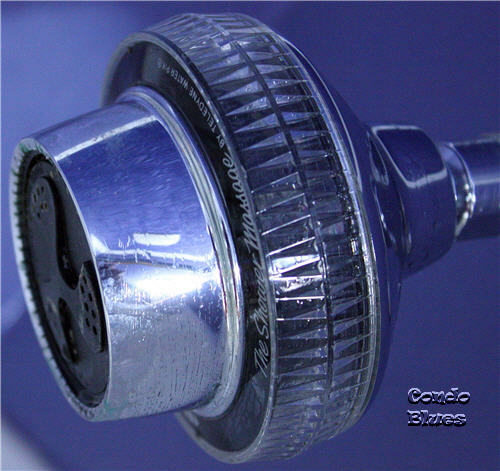 Condo Blues: Do Low Flow Showerheads Work? Do Low Flow Showerheads Work? I learned not to be picky about showers. When I was a kid, my family had a camper. 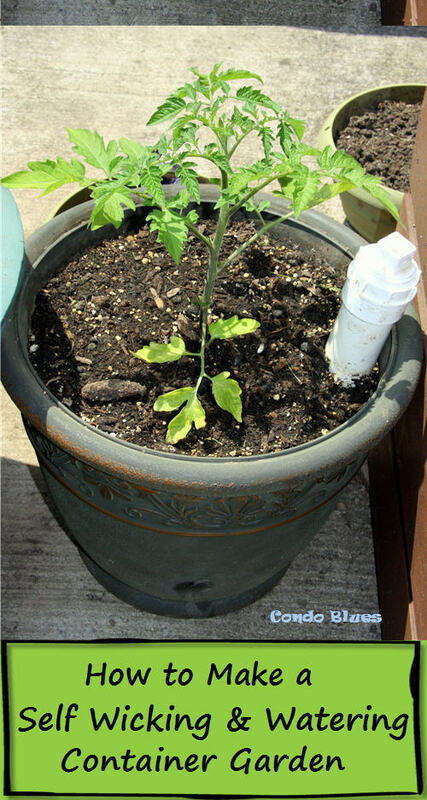 Piddly water pressure and sprays from the showerhead were a given. It prepared me for renting apartments. Showerheads in a rental fall under You Get What You Get and You Don’t Pitch a Fit. I didn’t give the piddle showerheads that came with our condo a second thought because showerheads are supposed to stink, right? While cleaning the linen closet, I found a new in the box showerhead. Then it dawned on me. I can change my showerhead to one that works. Maybe I can get one of those fancy water saving showerheads while I’m at it! I’m a real rocket surgeon. I know. While the project sat on my To Do List, I collected a few more showerheads. Since I have them, let’s compare them! My One Small Green change for March is switching my low flow showerhead to a super low flow high efficiency showerhead. In 1992, the federal government mandated showerheads use 2.5 gpm. This is considered a low flow showerhead. This is the type of showerhead that came with our condo. You may have a low flow showerhead in your house and not even realize it. 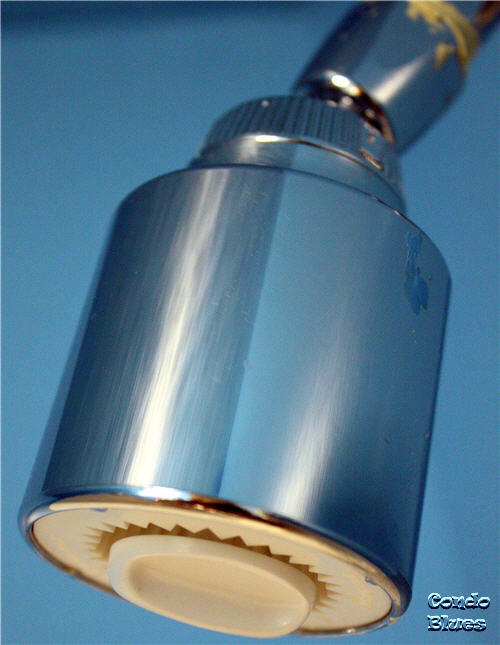 A high efficiency showerhead that can qualify for the Watersense label must use less than 2.0 gpm. 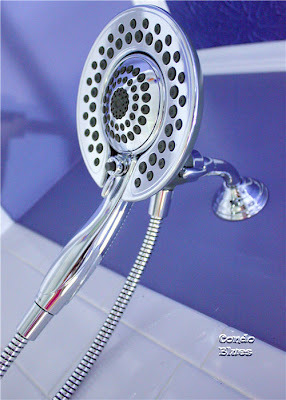 Showerhead water pressure can depend upon state, city, or the building’s plumbing infrastructure. The same showerhead may perform differently in different homes. That means my condo already has a water saving showerhead – that we don’t like. But every water saving showerhead can’t be bad, right? I came. I installed. We showered. A lot. Here’s what we think. The only thing I can say about this showerhead is it squirts water. That’s it. No real flow, no decent water pressure. You get what you pay for with this showerhead. Conclusion? Dislike. 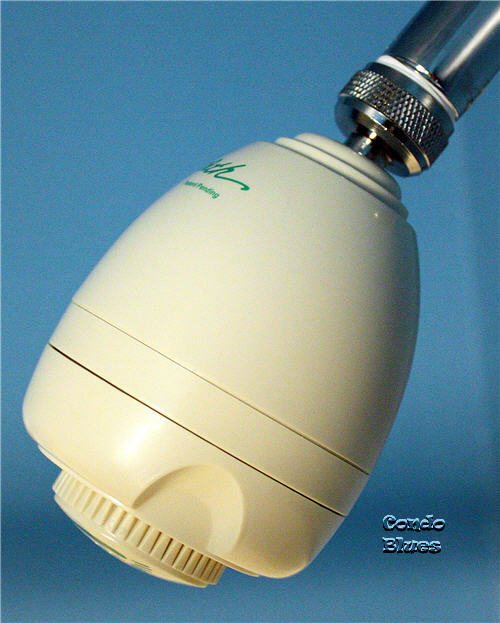 Waterpik Original Shower Massage – an older version I found new in the box in the back of our linen closet. I can’t remember where we got it. I suspect the Showerhead Fairy put it there. I replaced the builder basic in our bathroom with the Waterpik. The Waterpik is a huge step up in performance from the Builder basic. In fact, Husband thought I somehow scored an older showerhead because there seems to be more water per gallon. I think this has to do with the larger diameter in the shower spray. I like to use the massage modes to work out knots and post workout soreness. The downside? The Waterpik is not very attractive. Conclusion? Better but not great. Delta In2ition Two-In-One 4-Spray Shower – Delta Faucet Company gave me this showerhead after I visited their company headquarter. I am not required to blog about it but I am because I finally installed it. I replaced the Waterpik with the Delta In2ition. Truthfully, I planned to buy the Delta In2ition with my own moolala after my visit to Delta Faucet Company because I liked what I saw. It’s pretty. I’ve always wanted a shower wand to help me clean the shower and bathe the dog. The performance of the In2ition is a little nicer than the Waterpik. The 14 inch shower spray (with both the shower wand and head activated and wand together) is a nice improvement on the shower diameter of the Waterpik especially if you like to shower with a friend. I’m not sure how Delta did it but the massage modes on the Delta In2ition feel a bit more powerful than the Waterpik while using the same amount of water per minute. In2ition allows you to use only the outer ring or only the shower wand if you like. It has buttons on both to turn the water off to the showerhead/wand if you want to save more water by taking Navy style showers or while cleaning the shower and tub. Conclusion? Like the performance, like the more powerful water spray and massage mode, like I can probably save as much water as a Watersense rated showerhead because it makes it easier to take Navy showers (although I don't) without sacrificing performance (see below), like the style. Finally, I installed the Niagara Conservation Earth Showerhead. 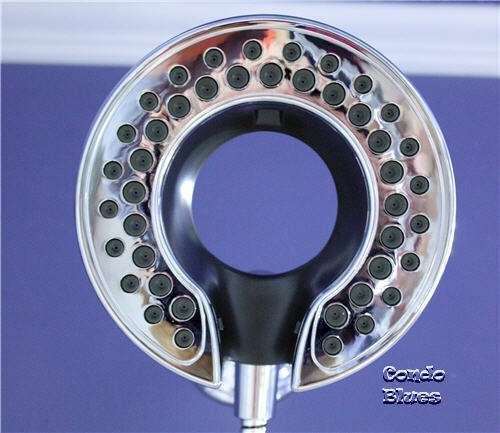 The Niagara showerhead looks just like you expect a high efficiency showerhead to look – ugly. Despite the look, I had high hopes the Niagara would perform better than or as well as the others. The Niagara’s lower flow and the small spray diameter makes rinsing off worse than the builder basic. The massage mode isn’t powerful and kind of pointless. We had the misfortune of finding the same showerhead in our last hotel room. It gave us the same lackluster results. Conclusion? We hate it. This One Small Green Change backfired in a big way because we don't like the Watersense rated showerhead and refuse to keep it. I reinstalled the In2ition in our bathroom and put the Niagara in the guest bathroom because I already donated the Waterpik to the Restore. I'll eventually replace the Niagra with a regular low flow showerhead. In the meantime I will apologize to every guest who has to use it. Sorry environment. I did not promise you a perfect green life, just an honest one. 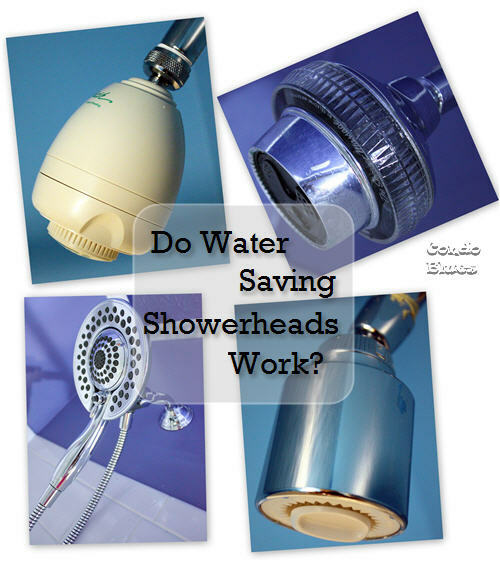 Do you have a high efficiency showerhead? Which one do you have? Do you like it? 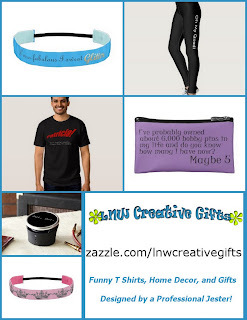 Disclosure: I was not compensated or asked to blog about any of these products. All opinions are my own and long time readers know I am highly opinionated. Homemade cleaning products are cheap as well they are safe for health because they do not contain any harmful chemicals. Vinegar, baking soda, lemon juice all are good, they have god level of acidity. Why Won't My Dishwasher Wash Dishes?